I used the frame background and Rob bird from GingerBread Twist CD Rom. I portrait them together and print them. I add it on top of my white card layer used sentiment from Sensational Sentiments Stamp from PolkaDoodles then finish embellishment with bow and white flower. This C&S card is just perfect to send to a friend, mother or aunt who's celebrating birthday. I hope you like this under 10 minutes Birthday Card! 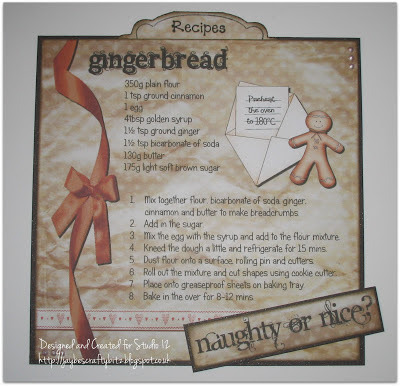 Gingerbread Twist - not just for Christmas! with a little something using the Picknix 2 Gingerbread Twist CD. I got to thinking how I could use it for something other than Christmas. and added several elements from the CD. and the little recipe tab is stamped from one of my own stamps. so what are you waiting for ?? Welcome to another Polkadoodle challenge! Before we move on to the winners from challenge 6 and this week's theme, we have a new lady in the house!! We are very pleased to announce that Manderly has joined the Polkadoodles team and watch out for her projects - they are coming very soon! Right, so who were the lucky top three from challenge 6 - Valentine Love? There were some entries that could not be considered for the top three as they linked up too many challenges - we don't have many rules but they are there to give everyone a fair chance! Congratulations to you all. Please email Nikky and don't forget to quote your winners code - we cannot release prizes without it! 1. Please follow the challenge theme! 5. If you have word verification on your blog it really does slow us down when leaving comments - please consider turning off word verification especially as the comment moderation has a spam section. Please don't forget our rules and good luck - the challenge ends on Sunday 3 March at 12noon GMT! The winner of the challenge will win a copy of the Colour Therapy DVD and second and third placed winners each get a download bundle! Ruth: I've gone completely outside of my comfort zone this week and used a tiny canvas - stamping and colouring directly onto it! 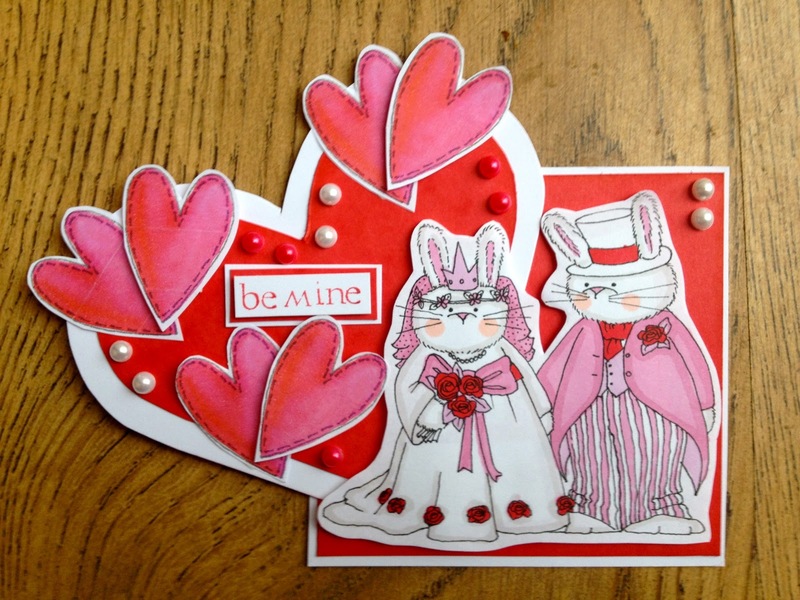 All the elements are from the fab Wonderland stamp set. 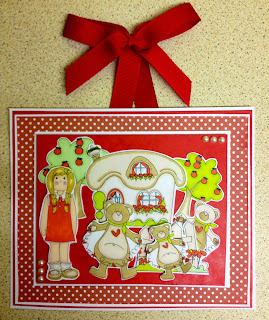 The sentiment and toadstools I stamped onto thick card and then added them as an extra feature to the canvas! Lucy ~ For this challenge, I was looking on the Back to Nature CD Rom. I always find something new each time I go on the CD. I found this gorgeous paper and printed it off on to printable vellum. I folded the vellum over the card (Image is A4), and secured with ribbon from the Fru Fru set. I added die cut butterflies covered in glitter and added glitter to the peacock's feathers. Margaret - For this challenge I have used an image from the scrumptious Sugarplum daisy CD which I have printed out a couple of times and decoupaged up and added some stickles glitter glue. 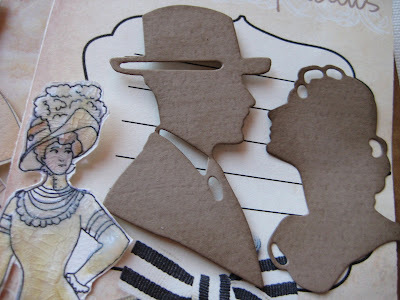 I cut all the embellishments and the bases for the round easel card out from Marianne dies. The sentiment is from the rubber stamp set Maggie with a bit of Tim Holtz distress ink through the embossing and on the edges of all the card. Anjie For this weeks card I have used the Sugarplum Daisy CD. I created the scene on the card then wrapped some acetate around the card creating a dome effect. I cut out some of the animals and put them onto 3D foam on the card and then added more on the acetate front giving it extra dimension. I added the beautiful image with glittered wings on the acetate so it look like she is approaching the house. I cut out some butterflies and put them on a piece of acetate and hung it over the edge of the acetate front giving it the illusion the butterflies are flying. 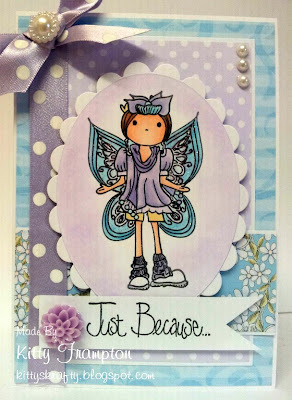 JAN: I've made an easel card this week using the 'Fairy Flutterby' stamp set called 'Bevvieboo'. I stamped and masked the fairy, then added the butterfly behind her to produce the wings - all coloured with my Promarkers and a touch of glitter. 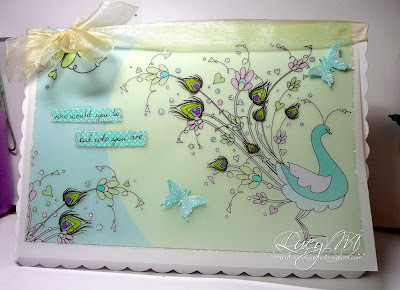 The sentiment and little baby butterflies are from the same stamp plate. 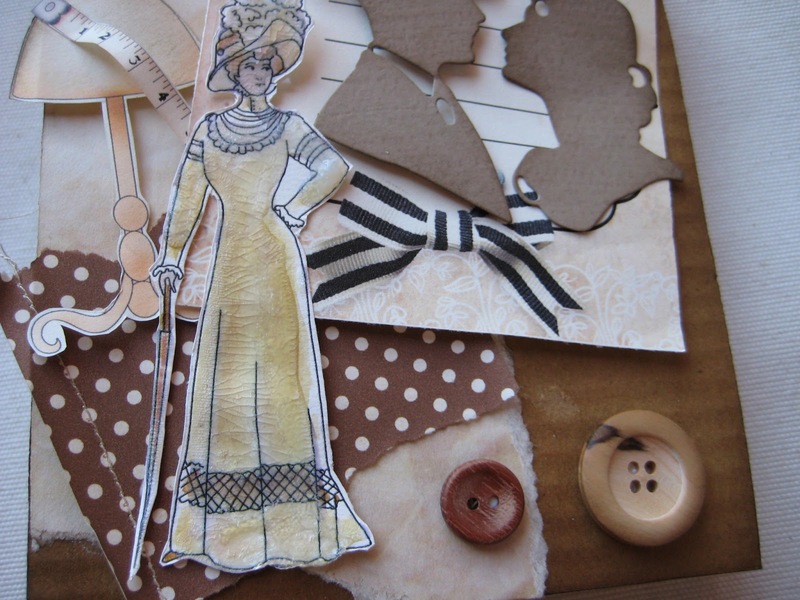 The background papers are from the 'Pen & Paper Circle - Issue 3'. Embellishments include some gorgeous little roses which can also be found in the fabbie Polkadoodles store HERE. 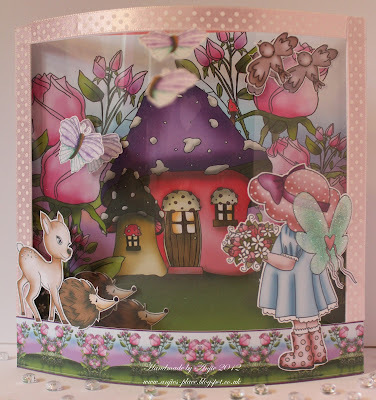 Pinky - For my card this time I used Cherryblossom Lane for the background scene, toadstool background and the little toadstool house. The little boy came from the Pretty Tuff CD and the sign post came from Studio 12 Picknix cd. I made a tri fold card using kraft card stock. I wanted to make it look like the boy has stumbled across a little fairy town!. Everything has either been printed ready coloured or coloured with Promarkers. 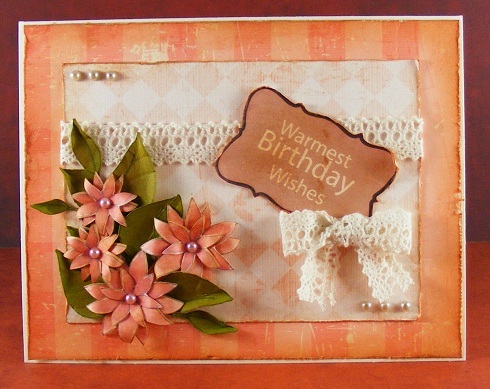 Lizzie - I used the Sugar Plum Daisy CD for my cards .... yes I made two again!. Well I printed two sheets off to decoupage the image so I didn't want to waste any!. For this card I tried to create a looking into the garden effect by using my dies to make apertures and layering them up. The paper and sentiment is from the CD too and I used Marianne die Open Flowers for the leaves. I made the flowers and added Dewdrops to the centre. For the second card I used my dies to make the card, the left overs from my previous card and another papers from the CD. Again the sentiment is from the CD, the Swirl and Leaves are both Marianne dies. For both cards I glittered up the flowers and images to add some pizzaz with Stickles glitter glue! Kim - I decided to make a 'treat bag' for a friend to fill with chocolates! (what could be better than a friend with chocolate!). I've used the Cherryblossom Lane CD and created a cute bunny with fairy wings!. The papers are also from the CD, with a little distress ink on the edges. I've coloured the fairy bunny with Promarkers and added acetate wings with some Stickles. Shell-For my card this week I have used the gorjuss Fairy Flutterfly stamp "Maxine" the papers and the tickets are from the Sugarplum Daisy CD. 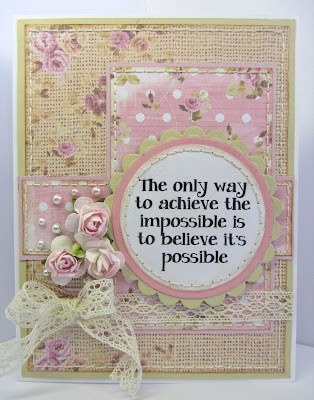 I then added a few pearls and flowers from my stash to complete my card. The stamped flowers are also from the stamp set. 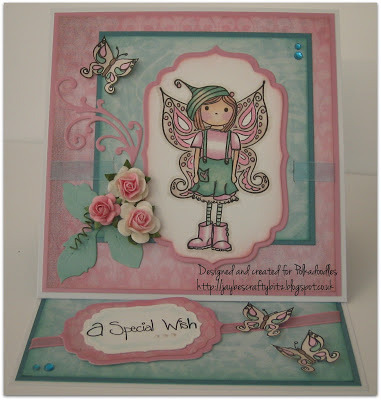 Kitty - I have used the lovely Fairy Flutterfly Babsie Stamp for the image and sentiment. All the papers are from the Cherry Blossom Lane. I simply added a few pearls, a bit of ribbon, glitter and a flower. 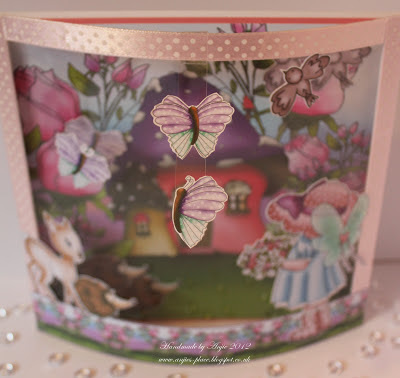 Clare - For my card this week I have chosen a selection of images from the beautiful Sugar Plum Daisy CD, I have used Nestibilities plain and scallop circles. 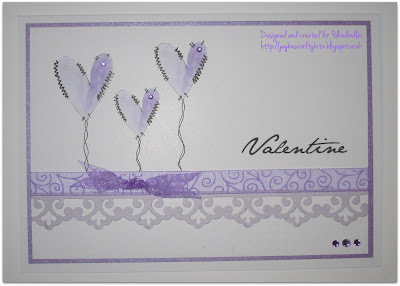 To finish off my card I have used Liquorice Doodle Dewdrops and Stickles Glitter Glue to embellish the images. Eva - I have made a little wall hanger for a child's bedroom. I have used these cute images from The Sundae of Seasons CD. 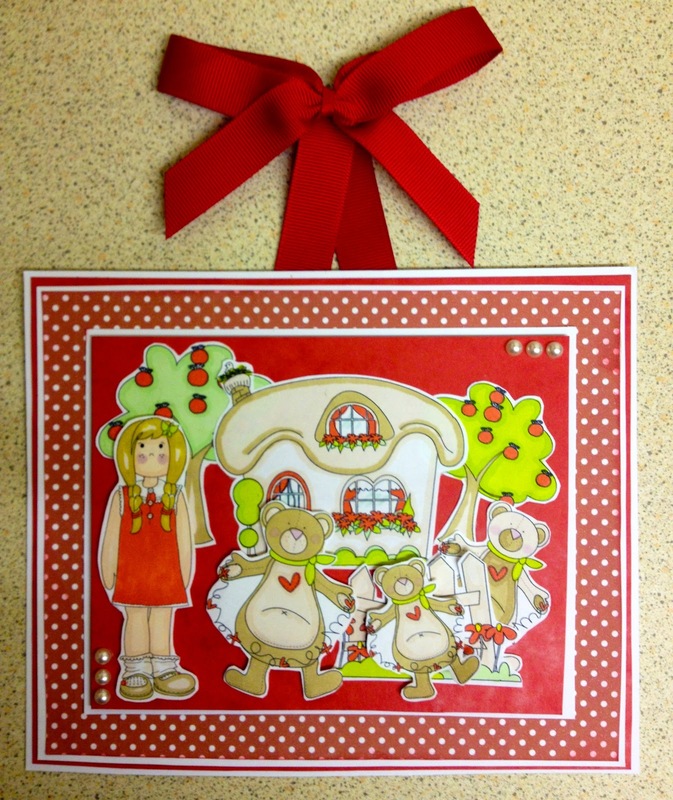 I couldn't resist the cute little bears, so made a Goldilocks card. The designer paper is also from the same CD. I used lots of white and red card stock, some stick on pearls and a red ribbon recycled from a chocolate box from Christmas. Please don't forget our rules and good luck - the challenge ends on Sunday 3 March at 12noon GMT! Morning all, Daniele here, its my turn for a Studio 12 project, I've made a tag with a bottom pocket so that you can slip another tag inside, all of the elements can be found on the Picknix collection 1 Cd, I printed out the back panel twice and layered up the lace just adhering the sides and bottom to make the pocket. All of the other images have been fussy cut and adhered, with added stickles to highlight the flowers. Hi, Anjie here with todays Studio 12 make. 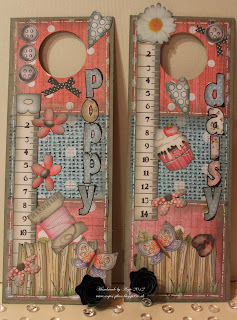 I have used the fabulous Studio 12 Picknix Collection 1 cd to makes these door hangers for my neices. I cut the papers into squares to create a patchwork effect and inked the edges with a distress ink. I cut out all the elements also inking the edges, and glued them in place. I added some faux stitching and finished them off with a Marianne D die cut flower. Good morning folks, Friday is here again and the year seems to be flying by very fast. Hoping that you all had a lovely day yesterday and all received a Valentine from a loved one. Now for the challenge and this week we would like to see your Shabby Chic creations and just take a look at all the fabulous shabby chicness the Design Team have cooked up for your inspiration. We have some fab prizes this week too as all the Top 3 will receive a £10 Gift Voucher to spend in the Polka Doodles Online Shop! Anjie For this weeks card I have used the gorgeous Sugarplum Daisy CD. The papers, image and sentiment are all from the CD. I have distressed all the edges of the papers and image with a file and then used a pink distress ink. I've then added some ribbon, flowers and pearls. I've added a bit of glitter to the wings to make them sparkle, and added some faux stitching. 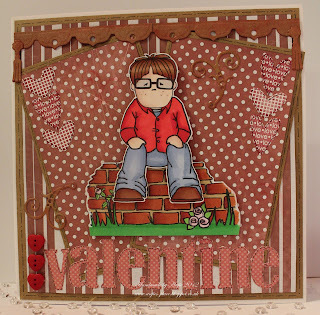 Sally - This card is one of my favourites - I used the stamp which was with the Pen and Paper No.5 CD and Magazine, I decided to colour in sepia tones as I had just watched my Colour Therapy DVD. 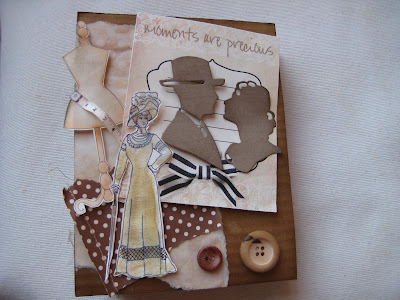 I cut out the image using a Spellbinders die, matted her on papers from the Pen & Paper CD and edged it in lace added a lace bow and wooden button. I used more papers from the CD rom to create the background for the card. I added a sentiment and some swirly vines. 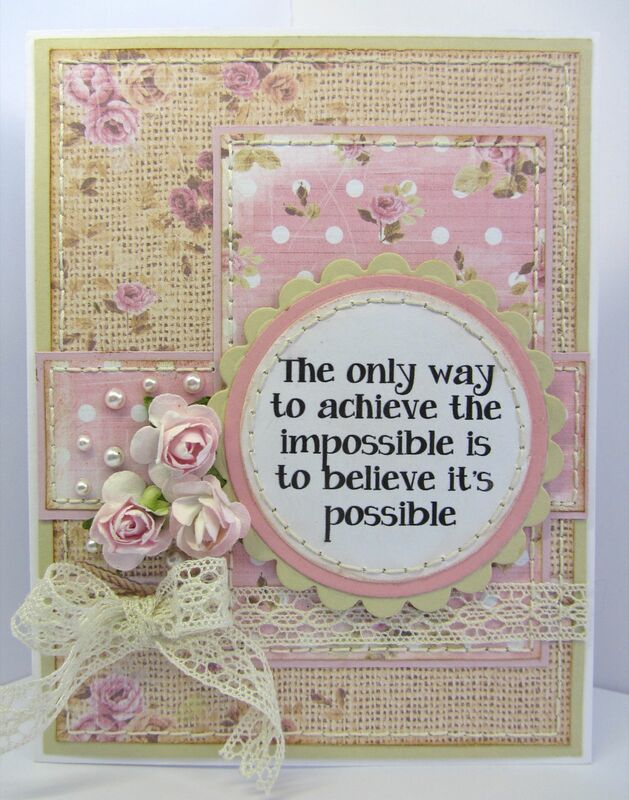 Asha - I mixed and matched 2 CDs to make this shabby chic encouragement card for a girlfriend. The beautiful papers are from the Studio 12 Picknix Collection 1 CD and I picked the sentiment from the brand new Cherry Blossom Lane CD. Embellishments from my stash: cream lace, flatback pearls and soft pink mulberry roses. To complete the shabby chic look I distressed and inked the edges and did some stitching. Karon - This week I really had to think out of the box for me; I have never made a shabby chic card before, but this is what I came up with. I used the All Sewn Up section from the Studio 12 CD Picknix Collection 1 for my backing papers, I have distressed the edges with a scissors and then inked. For my flowers, leaves and sentiment, I used the new Cherry Blossom Lane CD. I layered the flowers to give them dimension and added some detail to the leaves with a stylus. The sentiment was distressed a little and then some lace and a bow, and some pearl dots to finish off. Astrid - I have also used two CDs, one for the paper and one for the image. Cherry Blossom Lane, The gorgeous Lace is from a lovely friend, and the flowers handmade with the EK succes punch and a little bit of Distress Ink Vintage Photo. And behind the flowers a Marianne Design Creatable LR0157. Fliss - For my card this week, I decided to give my Alice stamp set a well deserved inking up. 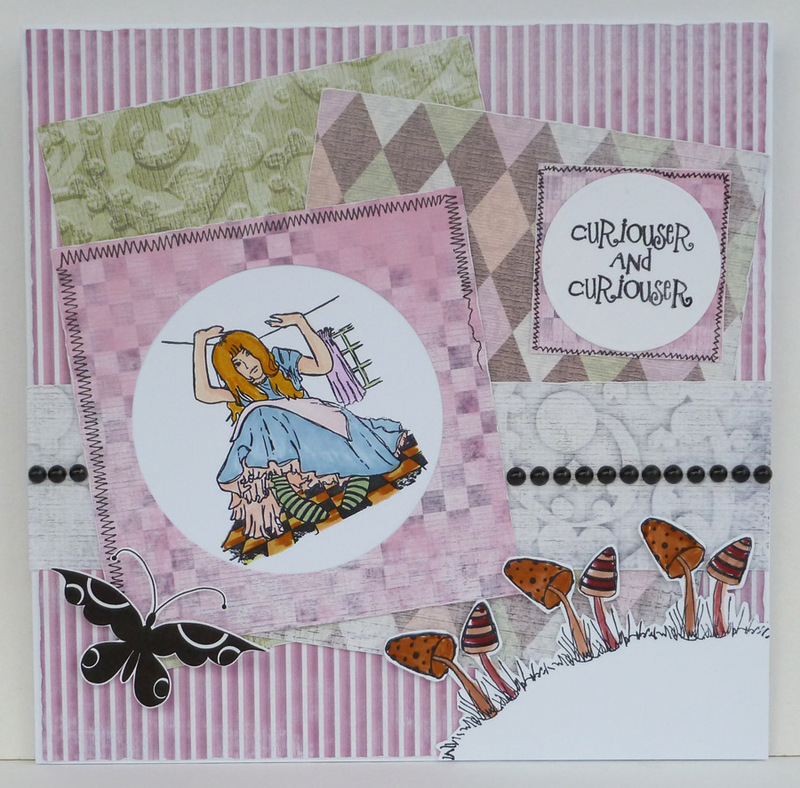 I stamped Alice, the curiouser sentiment and a row of toadstools on white card and coloured with a mix of Promarkers and Zig Art & Graphic markers. I trimmed round the toadstools for my corner piece. I printed out some pink and green papers from the Wonderland CD and covered the card blank with several layers distressed with an emery board. I set Alice in a frame and added pearls, faux stitching and a butterfly from Candy Doodles to finish. 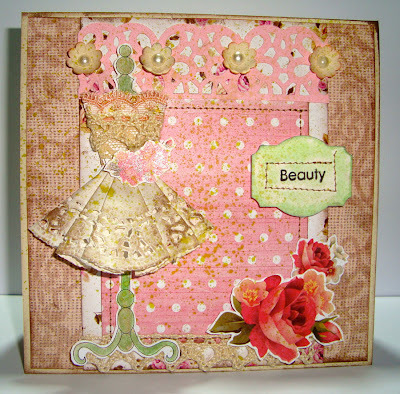 Lidia - My card for this week uses elements all from the Studio 12 Picknix Collection 1 CD from the All Sewn Up collection. I did some distressing with ink and added stitching. I dressed up the lovely mannequin with lace and a doily skirt and finished off with some flowers. So there you have it and what fabulous inspiration, I'm sure you'll agree! You have until 12 noon on Sunday 24 February to get your entries in and wishing you lots of luck! 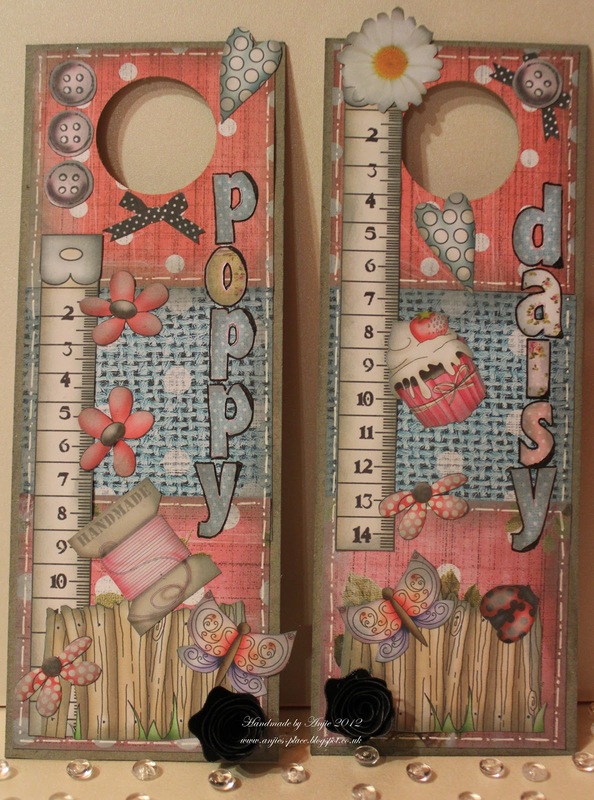 Studio 12 - Coming Up Daisies! Hello everyone, it's Fliss here today a little later than planned but here at last with my inspiration for February which is a little piece of home decor in the form of a heart shaped daisy wreath which came about with a certain romantic day now almost here. I re-sized and printed out the pretty bright daisies from the Heavenly Garden Collection on the first Studio 12 Picknix Collection 1 CD. I then cut these out (something to do while you're watching TV or listening to the radio!) then inked all the edges with Spiced Marmalade Distress ink. I die cut a large heart shape from an A4 sheet of acetate and then cut out the centre with one of the smaller dies in the set. 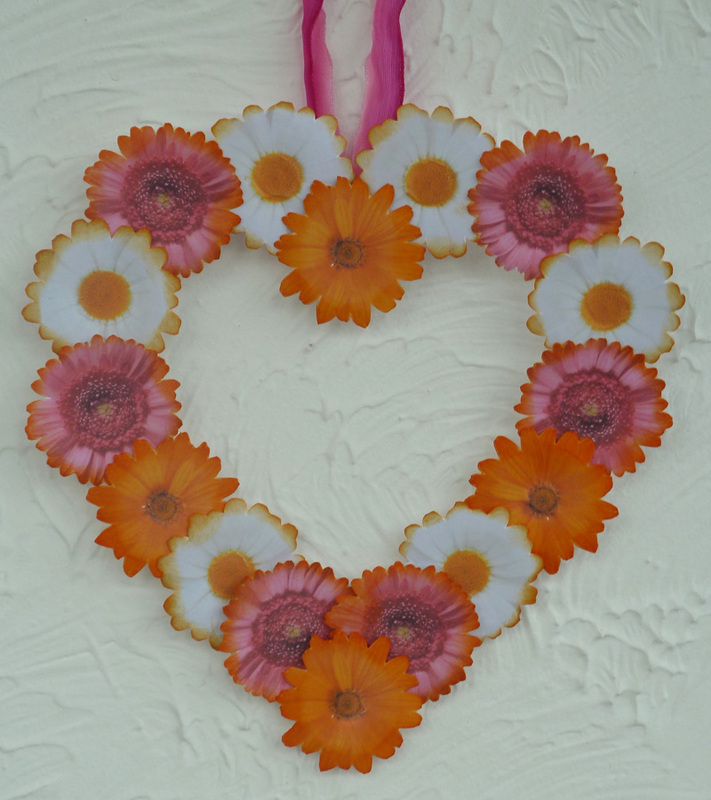 I then added the daisies with foam tape and a piece of wired ribbon at the top to hang it up. Simples! Hope you like this and do keep an eye out for the next Studio 12 creation which will be coming your way really soon. Hi all, Miria here with a new project for Studio 12. I decorated the front page of a photo album: I used images, frame and papers from Picknix collection 1 ; I coloured the woman with Distress and added Glossy Accents: I "freezed" it to create craquelè effect. 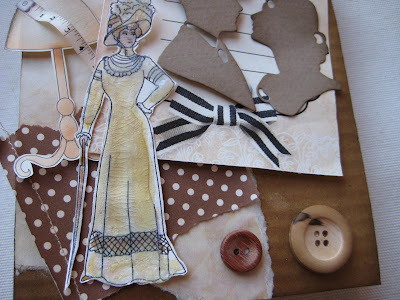 I stitched one paper in the corner and added buttons and two dies from Marianne Designs. It's Friday again so time for another Polkadoodle challenge!! We've added a sticky post to the top of the blog with all the current challenge details on and with an easy click and find - that way you don't need to scroll through all the posts to find us! Mind you, there have been some rather fantastic Studio 12 Projects during the week - its amazing how different the design team sees the image that Nikky draws and creates! And don't forget that February is Fabulous here at Polkadoodles because all the cd's are £9.99 each!!! Go on - treat yourself to a Valentine gift!! So come on - show us what you can do! Before we move on to the Design Team samples, I need to announce the winners from Challenge 4 - Monochrome / Monochromatic. The deadline for the challenge is Sunday 17 February at 12noon GMT. Good luck! The first placed winner from this challenge wins a copy of the Picknix 1 cd. Second and third place wins a download bundle each! Ruth: I've rediscovered the Love and Cherish cd and I printed one of the images onto my card base. I then used a fancy die to cut it out and also for a layer behind (I cut it in two so it would stretch!) I've inked the edges and added some half pearls from my stash. 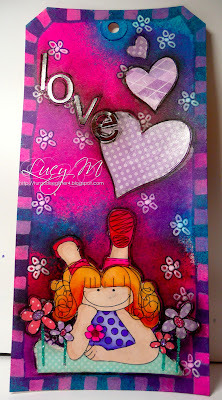 Lucy ~ When I saw this theme, I knew instantly I wanted to use this digi image. This girl is definitely in love! I made this art journal tag with ink sprays. 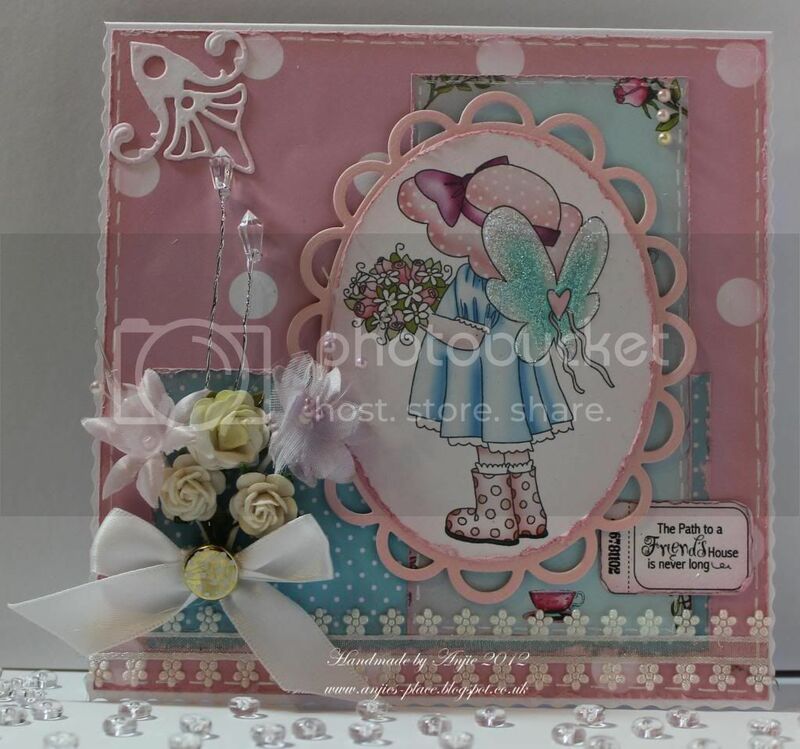 I then stamped the flowers from the Flutterfly fairies stamps on to the back ground, and on to the lovely papers from the Pretty Sweet CD Rom. I then cut them out stuck them on. I also used the papers for the hearts. Clare - I have made a telescopic card for the challenge this week. 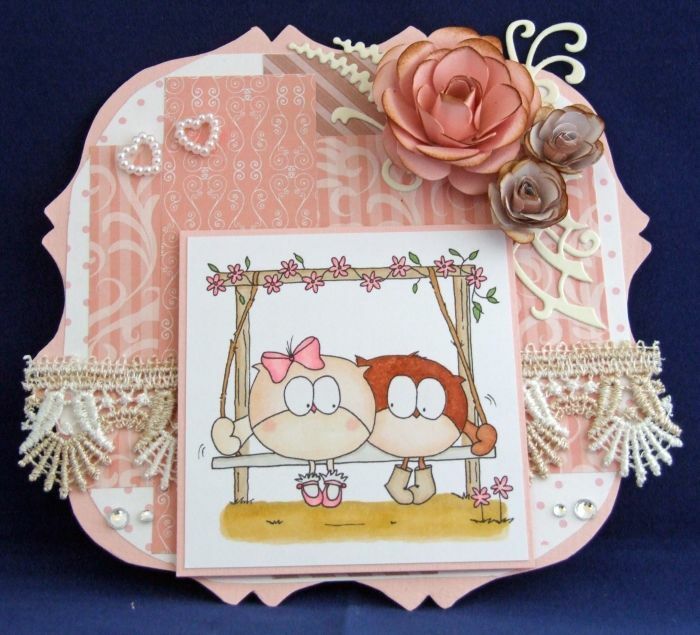 I have used papers, images and sentiment from the gorgeous Cherryblossom Lane CD. 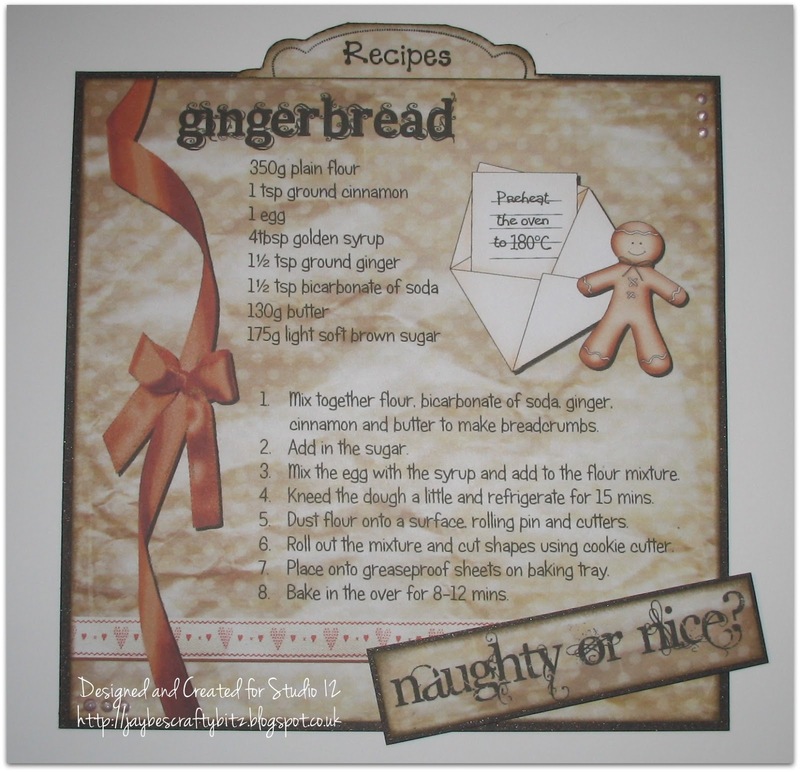 I coloured the images with Flexmarkers and added Silver Stickles Glitter Glue for decoration. 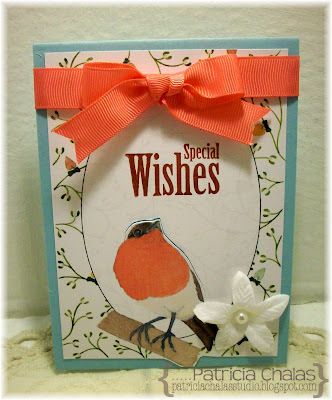 I have used Spellbinders Nestabilities Dies for the shape of my card. 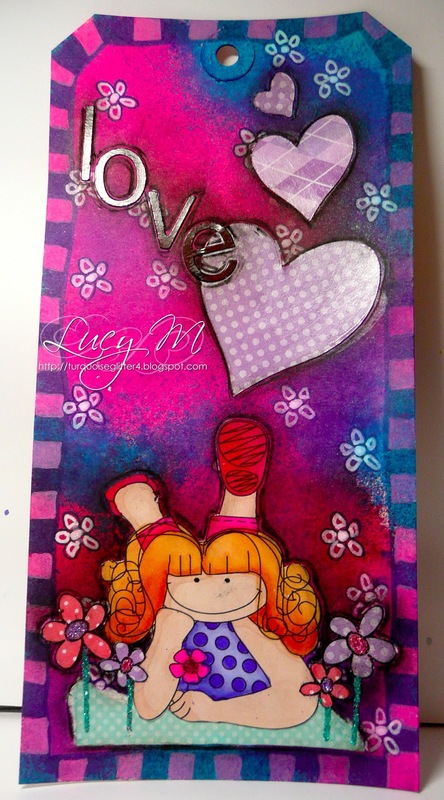 Lou: One of my New Years Resolutions this year is to do more stamping and incorporate it more in to my crafting. 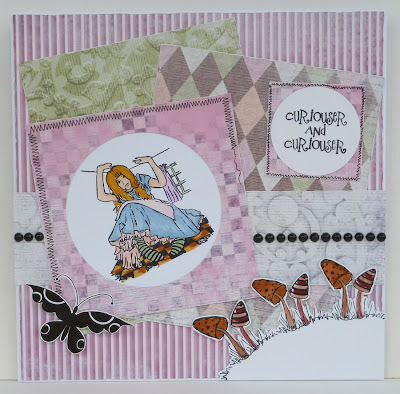 So this week I have used the fabby "Wonderland" stamp set to create my card. The doily has been over stamped with the "Queen of Hearts" sentiment and then the sentiment has been stamped seperately. The handcut hearts, border strip and Marianne butterfly diecut, have been stamped with the dog-tooth check. I have only used one ink colour; Tattered Rose distress ink. 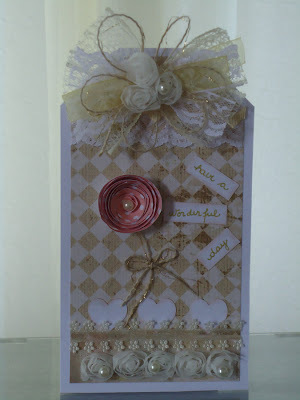 The card has been further embellished with mica flakes, rose ribbon, gems and silver flourish diecuts. 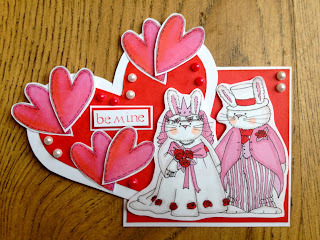 JAN: I wanted to do something different for this challenge and have gone for a very 'clean and simple' looking Valentine card in contemporary colours. The hearts (and paper used for the lacy border) are both printed from the 'Cherryblossom Lane' CD with a little added ribbon from my stash. The word 'Valentine' was printed on my pc before I assembled the card. Pinky - I used an insert from CHERRYBLOSSOM LANE for my base. I also used the hearts from this cd, printed off in two sizes to layer up. The alphabet came from STUDIO 12 PICKNIX and the cute little boy digi stamp came from PRETTY TUFF. He is coloured with PROMARKERS. I finised it off with some DOODLE DEWDROPS in Berry Red and inked the edges with a cerise PROMARKER. I followed this through on the inside which you can see on my blog. Lizzie - I got carried away and made two cards !!! I used the LOVE AND CHERISH CD.... Oh boy its gorgeous, hence the two cards ! I was so spoilt for choice ! It was purely time available that stopped me from making more !! The first card I made was a very clean and simple one. I used a paper from the Boundless Love section,some ribbon and a Diamante Buckle. The second card I made I used papers from The Two of us and Cherish sections of the Cd. Image and paper ribbon from The two of us Section. I also used Marianne dies for the hearts and leaves. Added a few flowers, some Stickles glitter glue and voila ! Kim - I got well and truly carried away with the gorgeous Cherryblossom Lane CD and used one of the cute digi stamps from the CD, coloured with Promarkers and finished off with Glossy Accents. 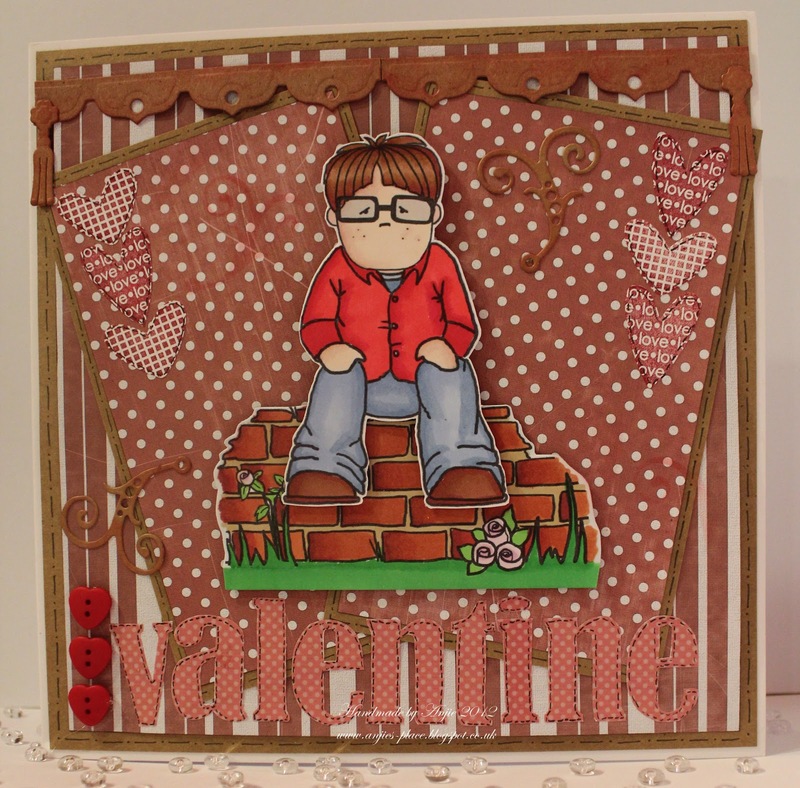 The backing papers and sentiment are also from the CD and I've added Marianne die cut hearts. Anne - I've used three CD's for my card this week. The papers are from Sugar Birdies, image and embellies are from Sundae of Seasons and the sentiment is from Sugar Plum Daisy. How's that for mixing and matching? Shell-for my card this time I have used a gorjuss Emma Canning digi stamp that I have coloured with my copics. The papers are from the Studio 12 picknix cd , I just added some ribbon from my stash and a computer generated sentiment to finish it. Kitty - I used a lovely Emma Canning Digi Stamp and teamed this up with some lovely papers from the Cherry Blossom Lane CD. I simply added some ribbon and rhinestones. Eva - I used a cute image from the Cherry Blossom Lane CD. I coloured it in with Pro Markers. The hearts are from the same CD. I used white and red card stock and added some pink and white stick on pearls. The sentiment is stamped with my mini alphabet stamp set from Hampton Arts. Anjie The image is from the Pretty Tuff CD and coloured with ProMarkers. The papers and alpha are from the Magical Winter part 2 CD. I've matted the papers onto Kraft card and I've added a few stamped hearts, some die cuts and heart shaped buttons. I've also added some faux stitching. Good luck and don't forget our rules! The challenge ends at 12noon on Sunday 17 February.